As you know, Esurance hosted the Esurance Pass It On Sweepstakes during the Super Bowl #SB50 yesterday. To enter the sweepstakes, you were asked to retweet anything that Esurance tweeted on Twitter or make up your own tweet or retweet any tweet you saw with the hashtag #EsuranceSweepstakes. Sixteen winners won $50,000 throughout last night’s game and one of them was a Sweeties Sweeps Sweeper. 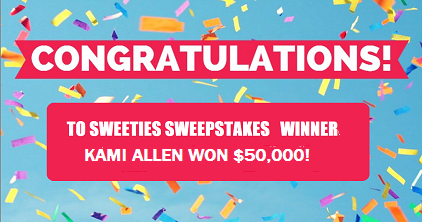 A BIG Congrats goes to Kami Allen who won $50,000. Please Click Here and congratulate Kami. Make sure you keep tweeting today until the end of the day for your chance to win the grand prize of $250,000 in cash! At the end of the game, Esurance released a tv commercial announcing it is giving away a grand prize of $250,000 to one lucky winner. To win the final $250,000 giveaway you can continue to Retweet messages from the Esurance Twitter handle tagged #EsuranceSweepstakes. The sweepstakes officially ends on February 8th, 216 at 11:59:59 pm PT. By the end of the game, the Esurance Pass It On Sweepstakes had garnered more than 2 million entries, generating more than 9,000 Tweets per minute at its peak, and trended nationally on Twitter. The third quarter saw the most entries with nearly 350,000 Retweeting for chances to win. A total of 16 winners were selected during tonight’s big game and now we’re doing the big one. Even with all of those staggering odds, one of our own still managed to win, AWESOMESAUCE! Awesome! Good for you Kami!